There was nothing for me to do but sit there and enjoy the spectacle. C.W. 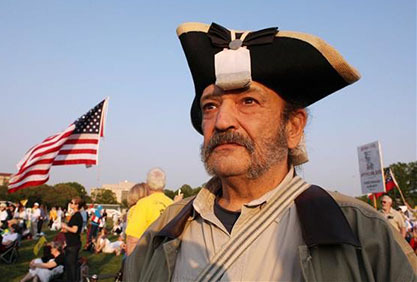 was in full animation sitting cross-legged on the living room floor in the form of an early American patriot. The only modern accoutrements were several tea bags hanging from his three-corned hat. “Just about finished,” he said. “The most patriotic, god-pleasing political platform ever designed by …,” he paused. “Who do you think oversaw the preparation of your Constitution in the first place,” he said with a taunt in his voice. “They didn’t mean our religion,” he said. “But here is a good one,” he announced proudly. “I am all ears,” I said. we are the true patriots. - C.W.